“I am going to make the revolution in the the sky” - Clara Thalmann, 1953. Clara Thalmann (née Ensner) was born at Basel, Switzerland, in 1910. She was one of ten children from a working class family. Her father was German and had emigrated to Switzerland because, as a socialist and an internationalist, he opposed conscription for the German war against France in 1870. On the 27th January 1987, after a long illness, the Swiss revolutionary Clara Thalmann died at her home on the outskirts of Nice in the south of France. Clara grew up in atmosphere of committed socialist activity. 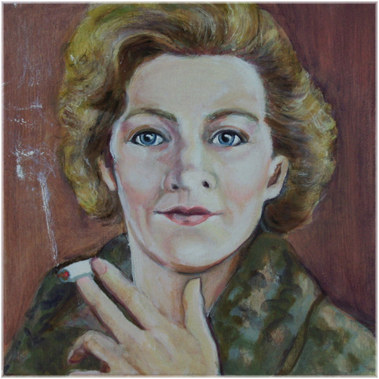 Early in life, influenced by the betrayal of social democracy with its pro-war attitude, and the success of the October revolution in Russia in 1917, Clara was attracted to communism. In the 1920’s when she was a young working woman she joined the communist party and worked on the French communist paper ‘Humanite’. Soon after Lenin’s death in 1924, however, the internal struggles within the communist movement began to be apparent. The new party leader in Russia, Joseph Stalin, systematically strengthened the bureaucratic apparatus at the expense of the influence of the few remaining revolutionaries within the party. Stalin’s campaign also affected the French communist party. It meant that committed activists like Clara could no longer carry out their political work where and how they saw fit, but rather had to follow instructions from party functionaries. A vivacious and passionate character like Clara could not stand it, and disillusioned, she returned to Switzerland in 1928. She immediately joined the Swiss communist party, but did so in order to fight against Stalinist policies. It brought her close to the disciples of Leon Trotsky, the former leader of the Red Army, now branded by Stalin as a “dangerous agent of the anti-Soviet counter-revolution”. The night that Clara returned from Paris she met a young worker from her home town of Basel who had returned that same day from Moscow where he had spent four years as a student at the Workers University. He too was very disillusioned with Stalinism. His name was Paul (‘Pavel’) Thalmann and it was the start of a life-long relationship. They were soon expelled from the party, but continued to make anti-Stalinist propaganda, co-operating with Trotskyites and left-wing communists from Germany. In 1936 the German Nazis arranged the big propaganda show which was the Berlin Olympic Games. In response, the international revolutionary movement had organized a workers’ olympics at Barcelona in Spain. Clara hitch-hiked south to take part. She went as a swimmer and as a Swiss working woman delegate. But the International Workers’ Olympic Games never took place. On July 17th 1936 the military coup d’etat against the Spanish republic led to the outbreak of the civil war which was to last until 1939. When Clara arrived at the Spanish border the anti-fascists had already defeated the militarist conspirators in much of the country. She witnessed the enormous social revolution which was occuring. The Spanish anarchist movement, the biggest working class organization in Spain at that time, at once confiscated large estates and factories, transforming them into collectives run by the workers themselves. Soon almost two-thirds of the land and industry under the control of Republican forces was collectivised and organized by the anarchists of the CNT and the FAI. Revolutionary committees and militias, rather than the state, controlled politics and the economy as well as the anti-fascist military struggle. Inspired by these events, Clara at once joined the anarchist militias of the famous Durruti columns to fight as a militia-woman at the Aragon front. Pavel also came down to fight for the revolution and joined her. But all did not go well with the revolution. Clara and Pavel were among the first to warn of anti-revolutionary developments inside the Republican camp. Because of their previous experience of Stalinist politics they at once realized the dangers posed to the social revolution by the Communist Party of Spain (PCE). Together with the liberal-bourgeois parties like the Republican Left (IR), the Left Republican Party of Catalonia (ERC), and the middle class tenant farmers’ union (the UDR), the communist PCE defended private property and the existing legal system. During the “short summer of anarchy” in 1936, when the social revolution was overwhelmingly successful and powerful, the Spanish communists did not dare to attack the revolution openly. Nevertheless the Thalmanns noticed their dangerous intentions and constantly warned their anarchist comrades. As they report in their autobiographical “Revolution for Freedom” (1) the Stalinists’ tactic to compromise the anarchist trend of the revolution was obvious to them. Under the influence of the Russians, the Spanish communists demanded that the anarchists had to join the government. The anarchists, seeking to gain access to badly needed Soviet arms supplies, finally agreed to disbanding the militias, but things continued to get worse. In the spring of 1937 the Stalinists turned to direct military aggression against the revolution. In May 1937 in Barcelona, communist provocation led to fighting between petit-bourgeois parties allied with the Stalinists on the one side and anarchists, POUM and UGT people on the other The fighting left at least 500 dead and 1,000 injured. Subsequently the anarchists and their revolutionary comrades suffered a decisive loss of political power. Clara and Pavel were fighting with the Anarchist group “Amigos de Durruti” (freinds of Durruti) At that time Clara met and got to know George Orwell (“He did not know what was going on and his eyes expressed amazement, he had a terrified look”) who was sitting with his gun on a roof close to her barricade. Because of their pro-revolutionary participation in the Barcelona “May Days”, Clara and Pavel had to go underground in order to escape persecution by the S.I.M., the newly formed secret police organisation of the PCE. They decided to leave Spain and, some time later, were about to board a ship at Barcelona when they were recognised, arrested and taken to one of the SIM’s private prisons. They spent several months in Stalinist jails, while friends in Switzerland launched a campaign to get them out. Finally, after the intervention of a leading member of the Spanish socialist party, they were released. They immediately left Spain and travelled to Paris. During the Nazi occupation of France in the second World War, Clara and Pavel built up a small, independent, revolutionary resistance group in Paris. Their home soon became a safe house for Jewish and revolutionary refugees trying to escape. They were never caught and were able to help many people in this way. After the liberation from German Fascism, Clara and Pavel grew tired of life in Paris and eventually moved to the south of France to found an agricultural commune called ‘La Séréna’ on the northern outskirts of Nice. ‘La Séréna’ soon became a meeting place for revolutionaries from all over the world. Pavel died there in 1981, and in 1984, thirty years after its foundation, I went down there to visit Clara, together with a friend of mine. We were interested in talking to an eyewitness to the Spanish Revolution, one who was actively involved in struggle, but were also most interested in what she thought of present social and political movements. The week we shared with her and the other communards at ‘La Séréna’ was a time in which we not only got to know Clara Thalmann the popular revolutionary, but also got to know her in her everyday life. Her open-minded and lively manner conquered our hearts. It was great when we spent a second week together at the international anarchist conference at Venice in September 1984. We had long and interesting discussions on lots of subjects including: rank & file/self-management, structures of the anti-nuclear movement, social and political changes in the working class, imperialist oppression in Northern Ireland and the so-called Thid World, the (then) Miners’ Strike in Britain, etc. Clara took a deep interest in everything. As for the urban guerrilla struggles in Western Europe, she was frankly sceptical of their usefulness. She always maintained that a guerrilla has to act in connection with a social revolutionary mass movement – militarily and politically. For her a guerrilla war only made sense if a revolutionary mass movement already existed. Otherwise the guerrillas were in danger of developing policies which the people could not understand and were also likely to become authoritarian and elitist. On the other hand she saw very clearly the need for determined direct action, even if it is carried out by small groups. However, such action must be the actual expression of how the people feel and think. Clara’s main hope for future social and political change rested with the young. Their increasing contempt for official policy and their readiness to get up and revolt seemed the mainspring of her political optimism. She never lost her belief in the revolution. What an amazing life and biography!